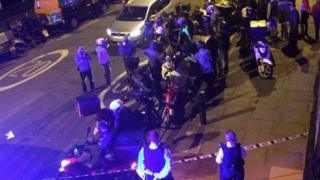 A 16-year-old boy has denied carrying out a string of acid attacks on six moped riders. The teenager, who cannot be named because of his age, is accused of targeting the men to steal their bikes, spraying them in their faces with a noxious liquid. He will stand trial in January. He is said to have stolen two mopeds in the attacks, spread over 90 minutes. Police said one victim suffered "life-changing injuries". The defendant, from Croydon, south London, appeared at Wood Green Crown Court on Friday and pleaded not guilty to 12 charges relating to the attacks on 13 July in north-east London. The offences include six counts of throwing a corrosive liquid with intent to "disable, burn, maim, disfigure or cause grievous bodily harm", two counts of robbery and four counts of attempted robbery. The youth was remanded in custody until the trial on 8 January.